You are the commander in the war zone. Across the valley, the large troop of enemy awaits. You are waiting for the reinforcements, but there is no word from HQ. Then, a wounded messenger arrives with a COPY of the message from HQ. He says the original was destroyed by the fire, but insists that he copied MOST of it. The message reads you should start the frontal attack next morning. Don’t worry, the reinforcement will come and air strikes will assist you. But, the massage has lost many words in the course of duplication, smeared with blood, and some of the sentences are incoherent. Do you carry out the mission? Probably you would, but being a little bit hazy on details, so you might carry it out cautiously. Do you still carry out the mission? What if the messenger destroyed the original retreat order intentionally, and made the forged message? This is one of the fundamental problems in communication. How much of the information is trustworthy? Do you ever know the message you just received has not been tampered in anyway? Believe it or not, the cinema is communication. We, audience, are recipients of the “message” transmitted by production companies, film directors, producers and anyone who is associated with the film in any way. Then, the quality of transmission becomes questionable if the external forces begin to add noise. Ozu’s “There Was A Father” is such a film. The original had long been destroyed, the only copy, a 16mm print, is below-the-standard quality. Furthermore, the original was produced under the war-time regime, while the surviving copy has been edited by Occupation Force. Reviews and critiques surrounding the film since have been less concerned about the transformation of the film under such conditions. It is all the more frustrating to nail down to which extent the film was transformed/degraded/re-engineered by external elements (chemical, physical, political etc.). As stated earlier, one of my concerns is the “darkness” of the film. As a recipient of the message of this questionable quality, I have to assume what I perceive may be the result of failed transmission. But the discussion of the available material may cast light on what was different about this message from other messages. Or what we should consider about this artifact, noises and forces external to this material. All images of the film are processed for grayscale histogram analysis, so let’s look at the actual data. Each frame has its own histogram. But to analyze aggregate of the frames, it is necessary to view them statistically. One of the metrics is the average brightness of the frame. This can be obtained by the summation of grayscale values of all the pixels in the shot. By rescaling the value from 0 to 1, each frame can be analyzed from the darkest (0) to the brightest (1). In simple terms, white is 1, gray is 0.5 and black is 0. According to this process, for example, the brightness value is 0.2567 for the Scene 2772. The grayscale of the Scene 2436 gives the value of 0.445. As you can see, the frame is much brighter with large portion of sky in the background, hence the higher value. The plot below is the value of grayscale average (brightness) of the frame as a function of time. For the record, the average of these averages throughout the film is 0.260, with the standard deviation of 0.065. The plot shows that the values are fairly consistent throughout the film, but there are six distinctively bright sequences, five of which are in the first half. Before going into details, let’s compare this plot with those of the other films. As I have noted earlier, I have processed the images of two films “How Green Was My Valley” and “Late Spring” similarly. These are the plots. 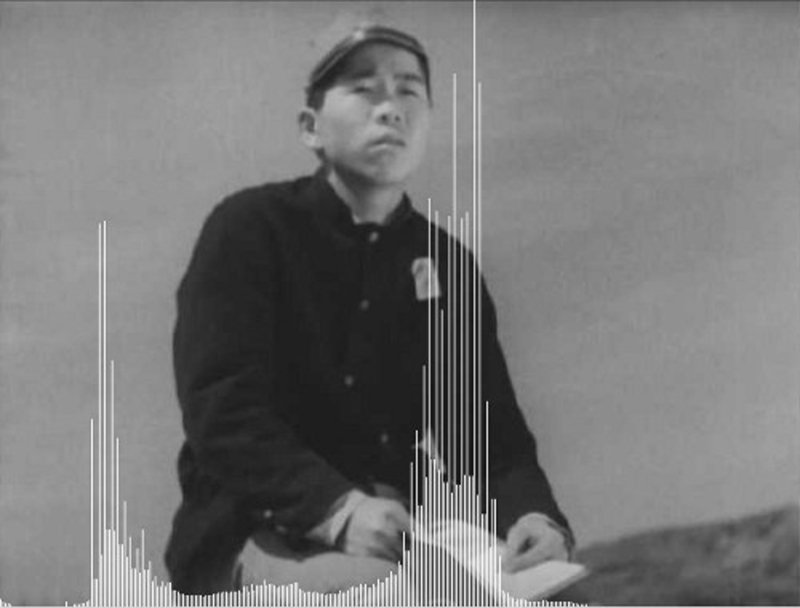 It is quite fascinating that the processions of grayscale values are distictively similar for two Ozu films, while “How Green Was My Valley” is much more noisier and somewhat featureless. In these Ozu films, there are “bright” sequences of substantial length, which stand out from the rest of the film. In “How Green Was My Valley”, there are bright/dark shots (showing up as spikes), rather than sequences. Moreover, the whole film gradually shifts down to darker note, only to be lifted up at the very end. In the next installment, I will look into the details of the plots and alternative approaches.